Tulsa Police are searching for armed suspects in two separate robberies, which could be connected, based on the witnesses' descriptions. 2 Works for You Reporter Gitzel Puente has more. 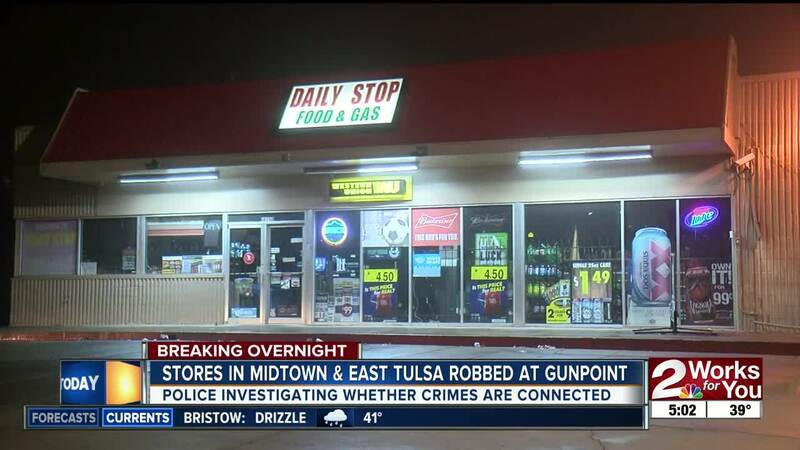 TULSA, Okla. — Tulsa Police are searching for at least two suspects in connection to armed robberies that occurred at a Walgreens and a convenience store. The first incident happened around 10:30 p.m. on Sunday at the Daily Stop on 11th Street near Highway 169. Officials say a female clerk was inside the store when a suspect threatened her over the counter with a gun. He demanded money and left with an unknown amount of cash. She described the suspect as a black male between 17 to 20 years of age, about 5'08" with a slim to medium build. He wore a dark blue or black hooded sweatshirt, dark colored pants and a black cloth or mask over the lower portion of his face. About two hours later, Tulsa Police officers were dispatched to the Walgreens at the corner of 15th Street and Lewis Avenue after reports of another armed robbery. Clerks working at the store told officers that two men walked inside armed with a silver handgun and demanded money. They stole money and fled out the store in an unknown direction. They stole money and fled out the store in an unknown direction. The suspects were described as black males, one tall and slim and the other medium height. They were both wearing dark clothing. Police are investigating a possible connection between the two based off the descriptions. This is still an ongoing investigation.